The black-plated Female XLR Cable Connector with gold-plated contacts from Attaché features die-cast zinc housing and chuck-style strain relief. 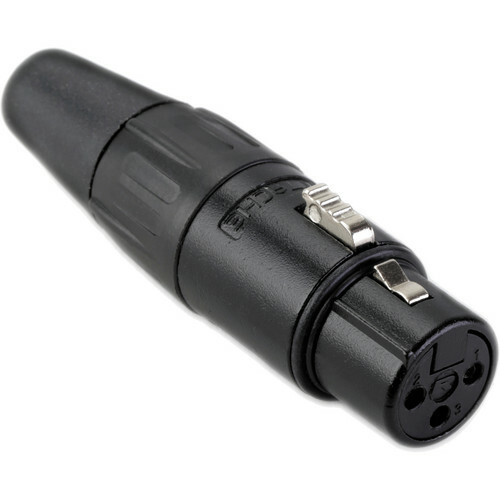 The connector is manufactured by Rean, a trademark of Neutrik. Box Dimensions (LxWxH) 5.8 x 4.4 x 1.1"
Female XLR Cable Connector (Black-Plated with Gold-Plated Contacts) is rated 5.0 out of 5 by 1. Rated 5 out of 5 by cjurczak from No Complaints Works as Expected This connector is exactly what I expected. I good connector at a good price. I've used better connectors, but they always cost X2, X3, X5 the price. If you want a XLR connector on a budget, this one is just fine.